A single butternut squash yields about two tablespoons of seeds. Just as with pumpkins, these roasted butternut squash seeds make a tasty treat. Set aside the seeds next time you prepare butternut squash and have yourself a small and nutritious snack. Preheat the oven to 275° F.
Remove seeds from squash and rinse with water. 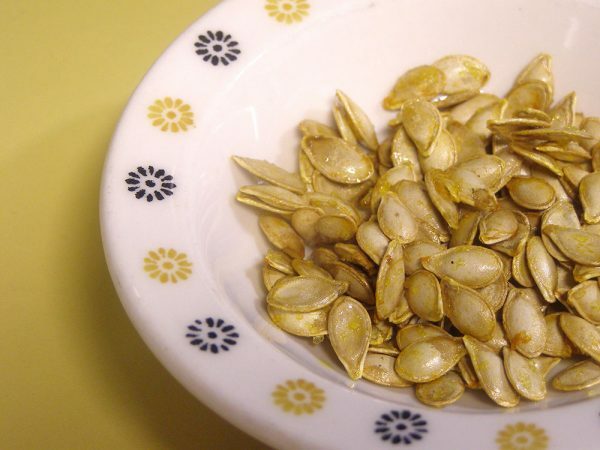 Remove strings and bits of squash from seeds. Place in a small bowl and stir in olive oil until seeds are evenly coated. Spreads in an even layer on a baking sheet. Bake until seeds start to pop, about 15 minutes. This Roasted Butternut Squash Seeds recipe yields two tiny servings. Approximately 57 calories per serving.